I love pedicures, especially when someone else does them for me. But the last few times haven't gone so well. So I've gone back to doing my own, like I use to for many years. I'm talking about the whole routine. It's a process and I have mine down. Actually, at this point, I can say that no one can give me a pedicure better than me. First, I start by pulling together the supplies. Pediclean Foot File, Coarse; the best foot file ever. I usually pick mine up from the Stillwater Spa at the Toronto Park Hyatt Hotel for about $20. Sally Hansen Problem Cuticle Remover is the one I've been using. It softens cuticles quickly, making them easy to clean up. Stainless Steele Cuticle Remover/Pusher - Helps to scrape those overgrown cuticles right off and finish them off by pushing your cuticles down. Foot Soaker - Make sure it can massage your feet to increase the quality of your pedicure. Some even have a feature that heats up your feet while their being massaged. Vinegar - calluses and helps the foot file to remove them faster. Great for cracked heels. Foot Soak - If you don't like the idea of using vinegar on your feet, there are many foot soaks that you can add to help soften and soothe your feet. Towel - Grab your softest towel...like the ones that they use at the spa. Get all of your pedicure supplies together. Take off your nail polish. Fill your foot soak with warm-hot water. Don't make it too hot, make sure it's comfortable. Add 1/2 cup of vinegar or the recommended amount of the foot soak. Soak both feet in the foot soaker for about 10 minutes before you start using the foot file. Use the coarse side first and once you've removed the hard skin, switch to the medium side. Take your feet out of the water and dab your nails with the towel. Apply the Cuticle Remover cream along your cuticles. Wait a few minutes and put your feet back in the water for another few minutes. 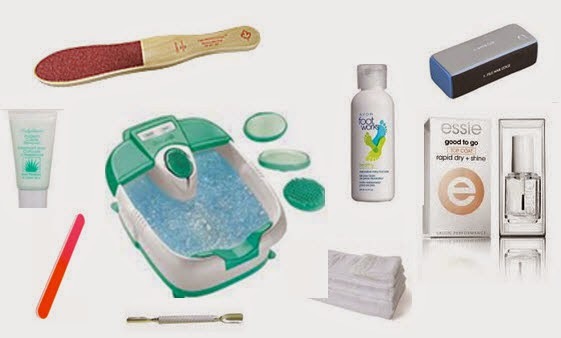 Take out one foot at a time and apply the cuticle remover and use the cuticle scraper/pusher to clean up your cuticles. When all the dry skin is removed, cuticles are cleaned up, and you've had enough of the foot soak, dry off your feet. Rub the moisturizer on your feet. Gently buff your nails gently and file them in to the desired shape. Two coats of nail polish that you feel like wearing and one coat of Essie, Good-to-go and you're done. The only step missing here is the massage, but you saved yourself a buck or two!